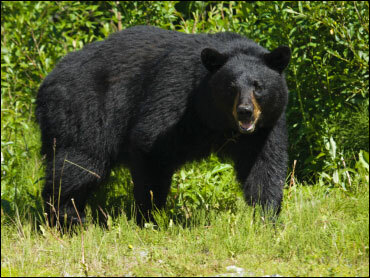 A brazen black bear believed responsible for about 21 break-ins in Montana over the past few weeks has so far eluded capture. Fish, Wildlife and Parks biologist Shawn Stewart says the Red Lodge area usually has three to five bear break-ins during a normal summer. Red Lodge resident Marek Rosin says he woke at about 1:30 a.m. last Thursday to find a bear had pushed open the door to his back porch and was munching on a supreme pizza in his chest freezer. Rosin scared the bear off before it could do any more damage. Stewart says most of the break-ins involve the bear climbing through a screened window or breaking through a screen door to access refrigerators or freezers. Meanwhile, the investigation into last week's fatal grizzly bear mauling near Cooke City, Mont. now involves allegations that a photographer may have been baiting wildlife near the Northeast Entrance to Yellowstone National Park, according to CBS affiliate KTVQ. KTVQ received a tip from a viewer about the "baiting allegations" last week. The viewer, told KTVQ that the host of a campground near Cooke City raised concerns that someone may have been baiting bears two weeks prior to the incident. At the same time, similar information was posted on an unofficial Yellowstone National Park Facebook page, which generated nearly 50 comments. Ron Aasheim, spokesman for Montana's Fish Wildlife & Parks department, told KTVQ that his agency is aware of the allegations, and FWP is investigating. He added that the agency looks into any allegations that may help explain the bear's unusual behavior, particularly if it might involve illegal activity such as baiting or feeding wild animals.